I wonder two things about the playsuit: first, were people going to like, or dislike, the non-pattern matching at the waist (I looked at it for a long time, and realised that there is no way it could have matched as it’s an un-balanced print and the seams on the bodice and pleats on the shorts don’t line up, so came to the same conclusion as SueAnne – you couldn’t match the stripes, but a belt would make the non-matching look right, as it did with the skirt, where two mis-matched wrongs really do make a right! ), and second, if the topic of cultural appropriation would come up. Surprisingly, not so much, despite the fact, that, as Daniel noted, the playsuit might have been an excellent example of tasteful inspiration, had not the name landed it firmly in the mire of obvious and oblivious stereotypes. This week let’s look at a flip to last week’s choice: a very covered up garment, that was, for its time, more avant garde than the ’50s playsuit. 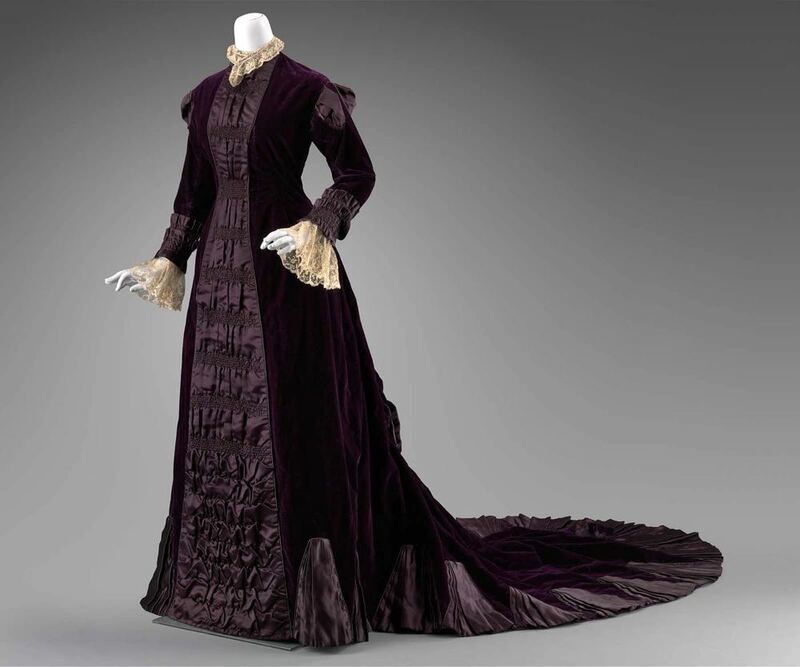 This 1880s reception gown of dark purple silk velvet with satin contrast and machine lace trims shows clear Aestheticism influence in its unbroken princess line combined with heavy use of ruching and historical-inspired details, such as the slashed ‘Renaissance’ sleeve puffs, and ruched cuffs and draping ‘engageants’ taken from 18th century fashion. Individually, none of these would be enough to clearly mark a garment as noticeably artistic, but combined, the effect is an undeniable nod to Aestheticism, while still remaining within the conventional norms of early 1880s fashion. What do you think? Do you like the tone on tone embellishment, the mix of high-fashion and aestheticism, and the dark, rich colour? I love the color. I like purples in general, and this purple is especially dark and rich; the velvet is wonderful. The lace at collar and cuffs are a nice touch, like a Renaissance scholar in a play, though the lace at the wrists should not have been so long and floppy. And I like the puffed sleeve-heads. Overall, a 7.5 out of 10. The color is so rich one feels like one could dive into it, and the lace is a beautiful contrast. I am somewhat bothered by the front panel – the ruching/pleating looks lovely in terms of a pattern effect, but somehow it “feels” heavier than I’d like. Overall, this is a garment which I would dearly love to wear to have a portrait painted. (were I able to fit into it). I stumbled on your blog recently and am in love! But about this dress…I really want to adore it. It has a great combination of textures and looks softer than a petting zoo. The color is to die for. But (maybe because of the fabric) instead of glamorous dress all I see is the fanciest nightgown of my life. Good night all, *rustle rustle* ignore my train as I climb into bed. I dislike the extra rouching at the bottom. The silk is so lovely, and the restrained roushing (however you spell it, and my light grasp on the spelling shows how much I care for it) is wonderful in mirroring the vertical princess lines. The bottom part? It looks like cratered skin. Edward Olmos shows us that life lived through the face is beautiful and interesting. But this dress? It looks diseased. Overall I like it. the colors and textures are beautifully combined. I’m not a big fan of the puffs at the sleeve caps and agree that the train is a little long, but you never know what the reasoning was of the original designer and wearer. Maybe she adored trains, and was an over – the – top kind of personality. Or it could have been a personal rivalry — she just couldn’t bear to hear her sister go on and on and on about her last reception gown. I am loving this dress. It probably helps that my head is full of natural form ideas for my current project. I love the colour, the texture change of the fabrics and the hits of cream at the neck and sleeves. The silk folds on the skirt and train remind me of Art Deco architecture only 40 years too early, but I like it all the same. I also love the ruching on the front panel, but only down to the knees. I would have preferred if the lines of ruching had continued down rather than the fabric pinches it changes to. 8/10 from me. If I could squeeze myself into it, I’d definitely wear this everywhere. I like, 8/10 for me. The purple/plum color shades are fabulous and really make the dress stand out. The princess line really lets the velvet stand out. However, I do agree that the ruching seems a bit overdone. Also, with the long train combined with long sleeves makes the dress read more like a day dress with a long train attached. madly in love with it.. color texture everything..
Oooooh I want it. It looks comfy and cozy and luxe and fabulous. I don’t normally like aesthetic movement, but this stays well enough within current fashion canon to pull it off. Oh I love it! 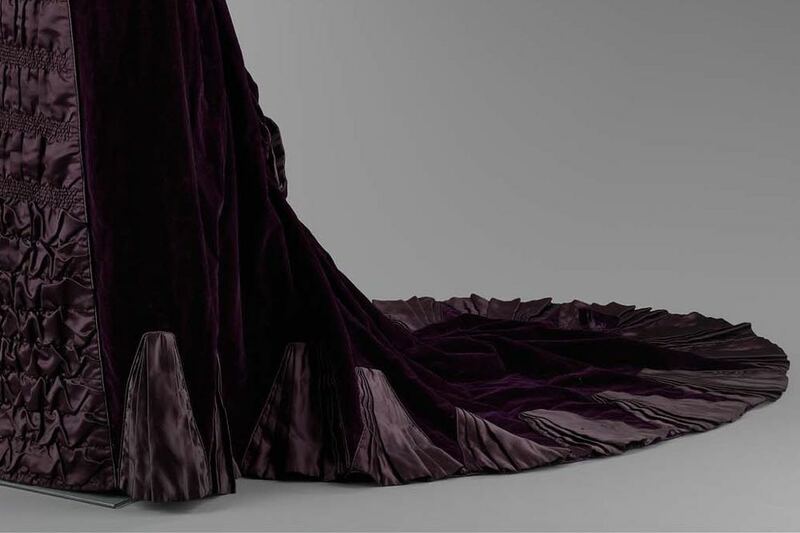 The colour, the weight, the shape, the restrained decoration, that velvet. It looks gorgeous and really quite comfortable. I could do without the puffed/slit sleeves, which I feel would do better on a lighter, frothier dress. If The Dreamstress would decant me into a corset, I would wear this like a shot! I love the Renaissance riffs – this is the softer side of the period for those of us who are not string beans or under thirty. Lovely rich thing. I really like the gathering down the front section. Normally, I am not a big fan of purple, but this is dark enough to warm my heart. A purely personal rating – nine out of ten. Why don’t I read before I post? Heart. Heart. Not ‘hear’. Sigh. This time I get to play Fairy Godmother and wave my wand and fix it! Oh. My. Word. I love it for what it is in every way. But unlike most dresses, I want to wear this. I want to look at it from a me wearing it point of view, which I do not often take. Because like Lynne, I see a dress that the older and less lithe could wear with extreme elegance. In which case, I would want my purple a touch more towards the blue than this one is, and the lace a touch whiter. But that is not what I am rating it for – this lovely dress was made before my great grandmother was born for someone else so why should it cater to me! And thusly I give it a 10. Because all the things I love – purple velvet and ruched silk, princess lines, lace flopping over the and (my favourite shirt does this!) slashing and puffs and godets and changes in texture – OOH LALA!!! Love. Love that era, Lily Langtry, Sarah Bernhardt ooooo the Violet YES! 10 x 10 ! Gorgeous! Not a fan of the Rennaissance shoulder treatment tough. I love that purple! And find it beautiful that the design relies on texture for interest, rather than pattern or color-contrast. But the close fit, trailing train and lace swathing the neck and dangling at the wrists makes me feel it would be claustrophobic to wear rather than cosy unfortunately. So I’m on the fence but have to add points for such beautiful execution. It leaves me very strangely unmoved. It’s OK, I don’t feel strongly about it one way or another. The colour’s nice. The design’s nice. The detailing and fabric and textures are nice. The train actually works, proportion wise, for a tea-gown. Maybe the cream lace ruffles are a little too big at the wrists. Yeah, it’s OK. I just can’t get enthusiastic about it though. I don’t hate it but I don’t love it. 5/10 for me, I’m afraid – it’s just a bit meh all over. Let’s say 7/10. That seems more fair, actually, because it’s not actively horrible, and it’s kind of unfair to call it “boring” as it’s not really that bad, there’s a lot of detail and work and balance there. It’s a good dress to be worn because it doesn’t look like it would be overwhelming or dominant on a woman it fitted and who already had sufficent composure. So for that, 7/10 seems fair enough. While I really liked the green velvet dress we had a while ago, I think this time the velvet feels suffocating. I think it’s the combination with the high-necked cut and the dark colour. The ruffle-inserts at the hem strangely work on the train, although I would not like them on a non-trained skirt. Oh what a wonderful blackberry colour, one of my favourite colours. I love the velvet & silk together & the little touches of cream stop it being too sombre. But, the lace on the sleeves is too long, a little peeping out would have been better, it’s a bit Charles the first-ish & Cavaliers. Maybe this was a mourning dress? I love the design, and I feel like the trimming is just the right amount without being over or under done. I like the tone-on-tone; sometimes those are too boring, but all the trimming is put on in a 3D style to give it depth and texture. I DON’T care for the lace ruffle on the sleeves. The overall dress is grand and structured, and the lace is just too long and drapey to feel like it gives. But that can be fixed with a five second rip. Also, with the ruching pattern: I wonder if concentrating the heavier portion of the gathers more towards the waistline would make everyone like it more. The tighter rows do draw the eye downwards; I don’t mind that, but it also seems like putting them at the waist would have been more productive. I think this dress is exquisite and it looks to be in fantastic condition. Though it is hard to pull your attention from the drop-dead-gorgeous color, seeing all of the texture play really heightens the charm of the garment. The pleating and ruching are wonderful details, as well as the slashed shoulders. However, I think there could have been a bit more adornment to the bodice. It is a bold dress with delicate details that make you want to take a closer look. I. Adore. This. Dress. The princess seams, the perfectly-placed ruching, the little puff sleeves…even the engageantes – maybe I’m wrong, but I think the mannequin may be slightly too small for the dress, which makes the lace hit in the wrong place. 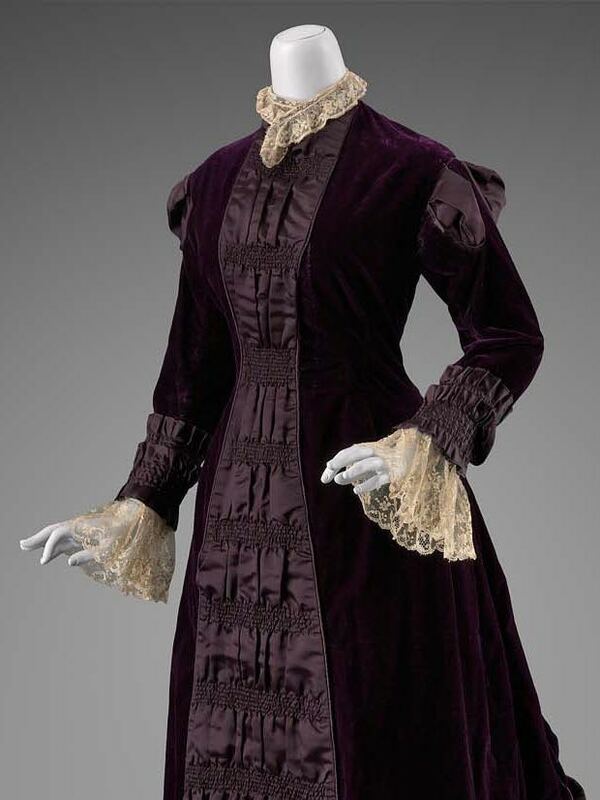 It’s my impression that dresses of this era tended to have very fitted, almost narrow shoulders, and on this mannequin the shoulders seem just a touch off the edge. A bigger mannequin might set the proportions straight. Or maybe I’m dreaming perfection that isn’t there. Who cares, I am in love.